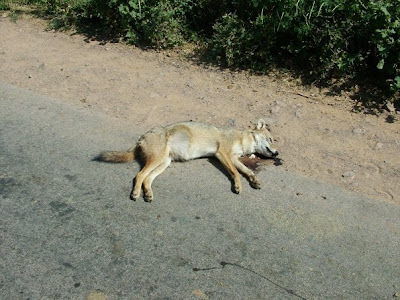 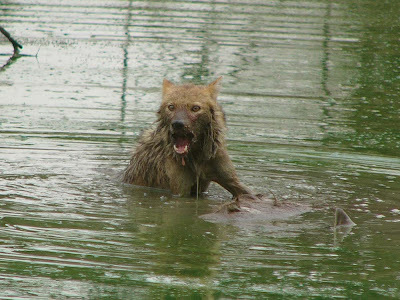 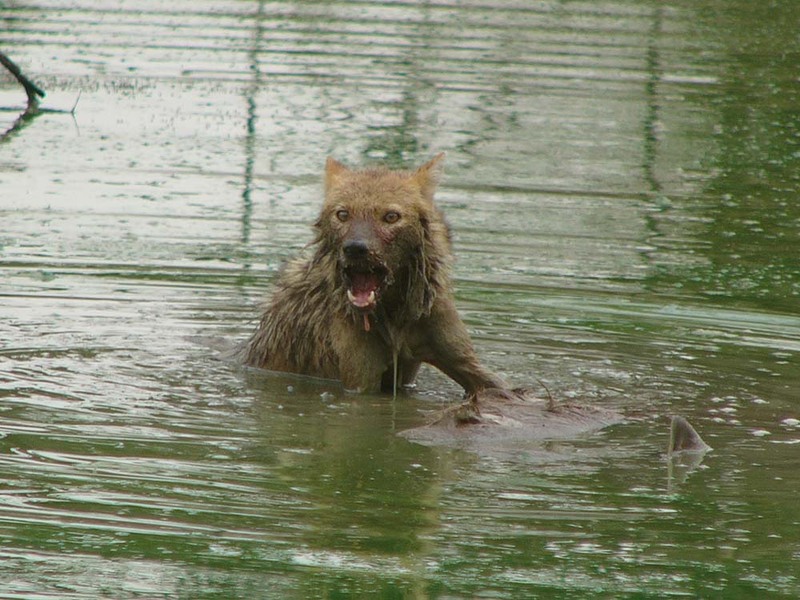 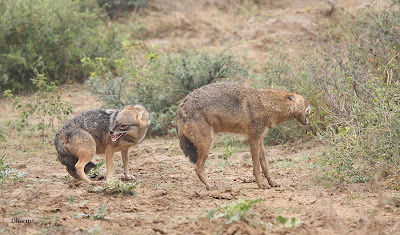 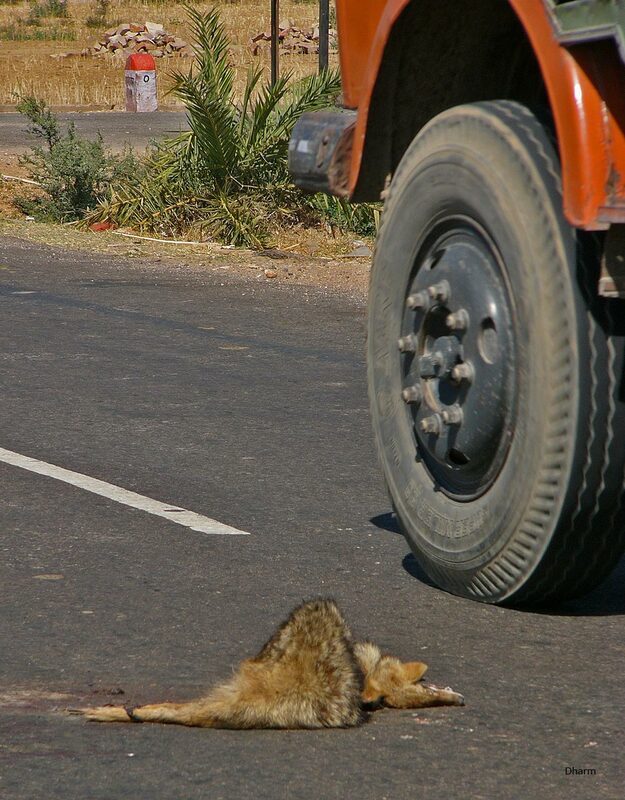 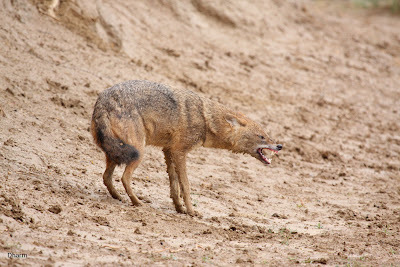 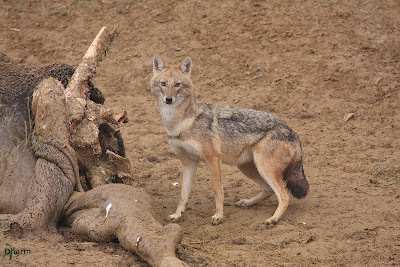 kal) created a forum on days of the Jackal which motivated us to put up this photo article of the images we had .. .they show some interesting behaviors of the Jackals. 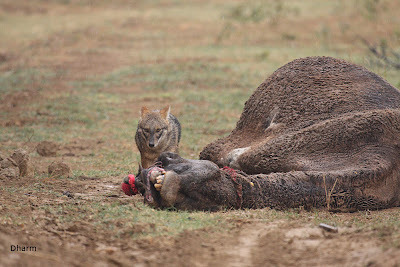 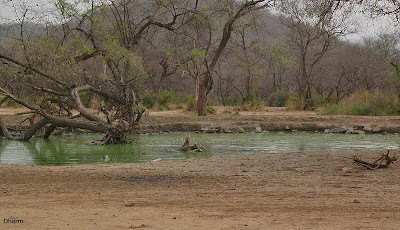 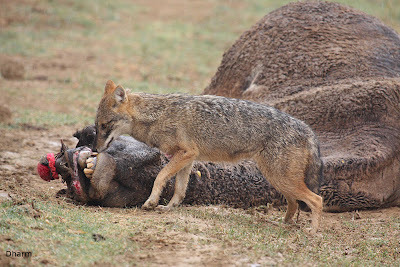 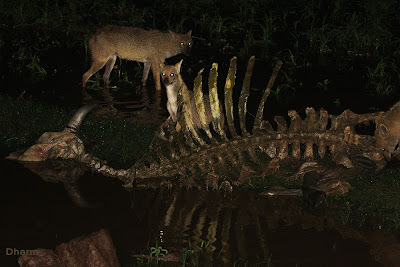 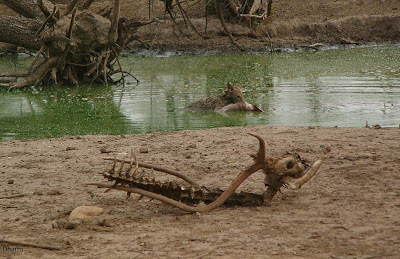 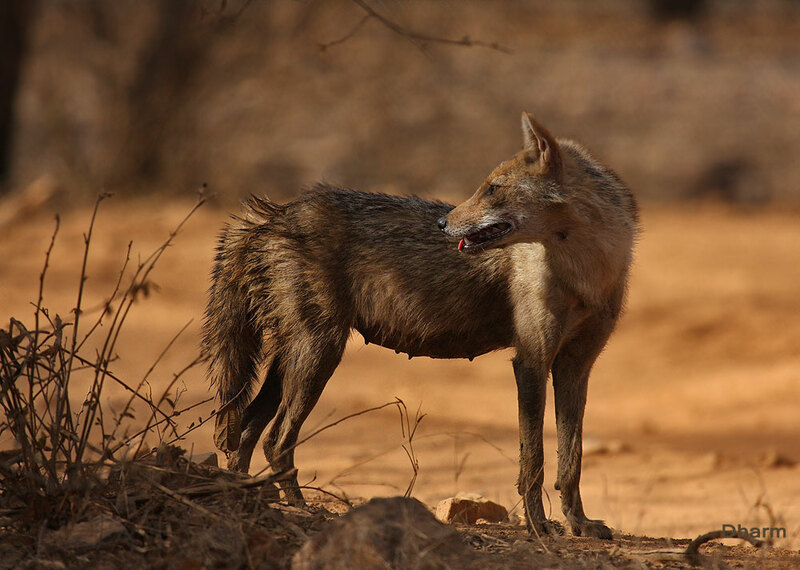 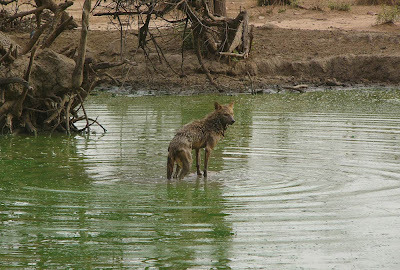 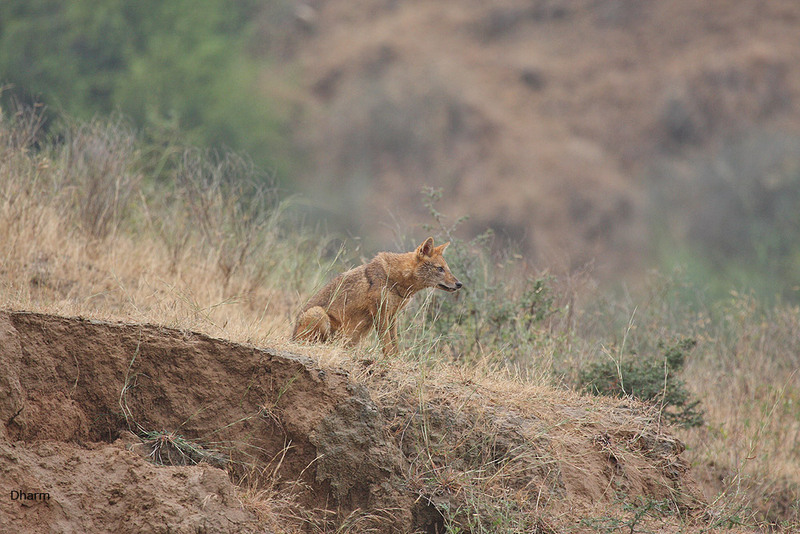 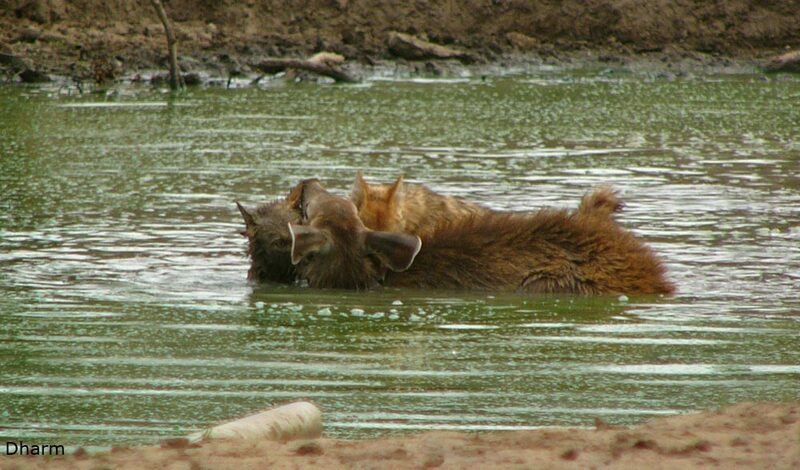 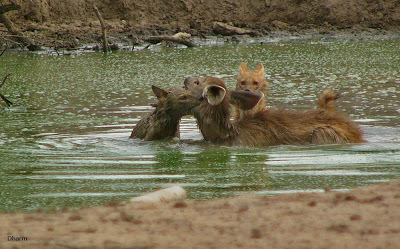 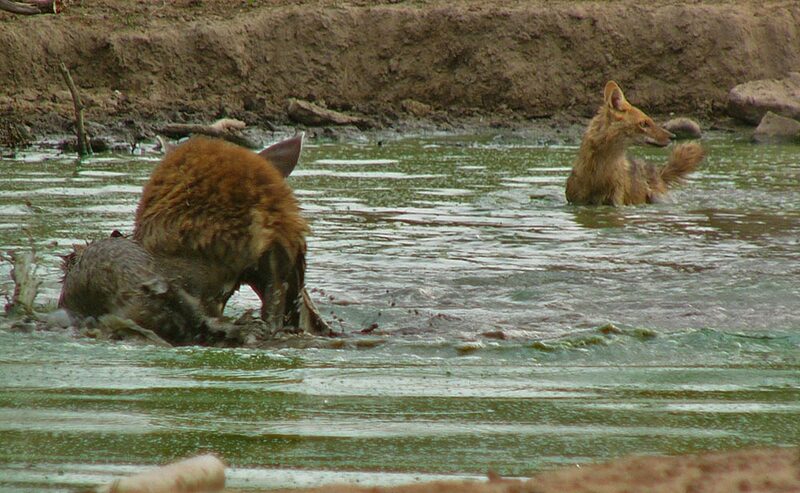 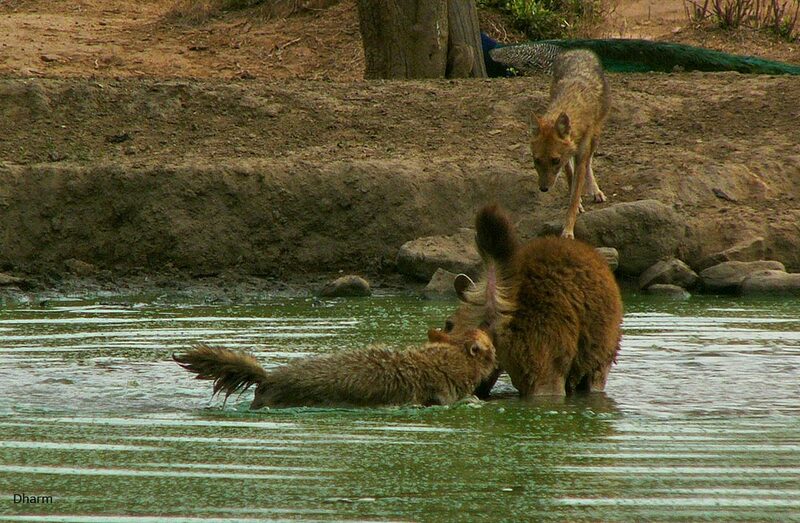 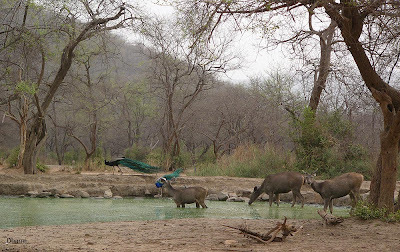 Two incidences are in photo sequel where the jackal is shown scavenging - the way it is percieved A Scavenger, however there is an instance where 2 jackals killed a Sambar fawn in Sariska Tiger Reserve. 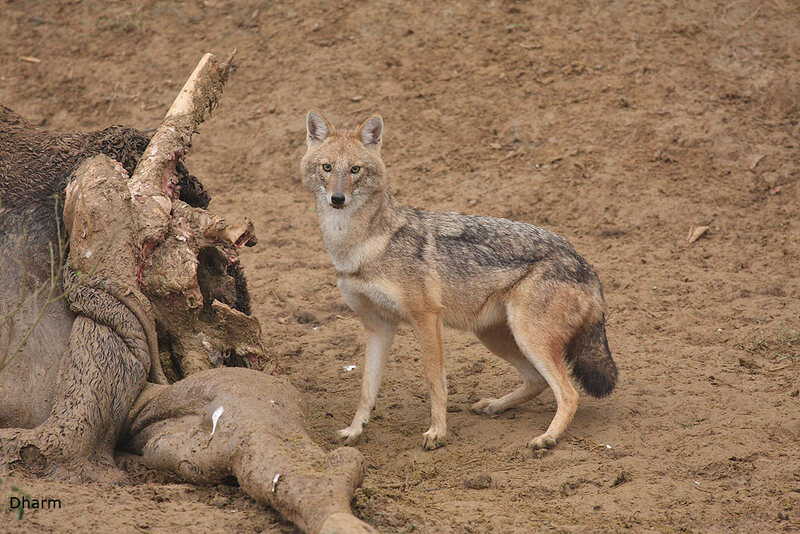 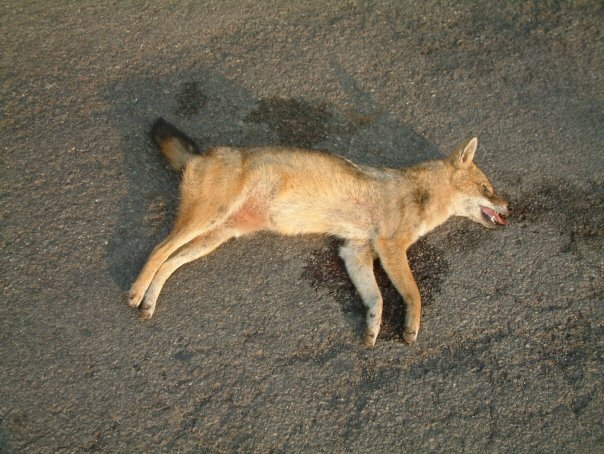 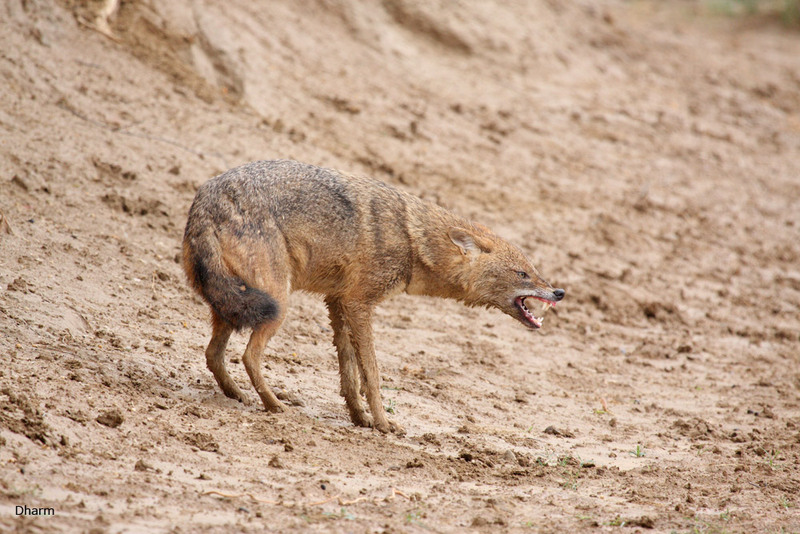 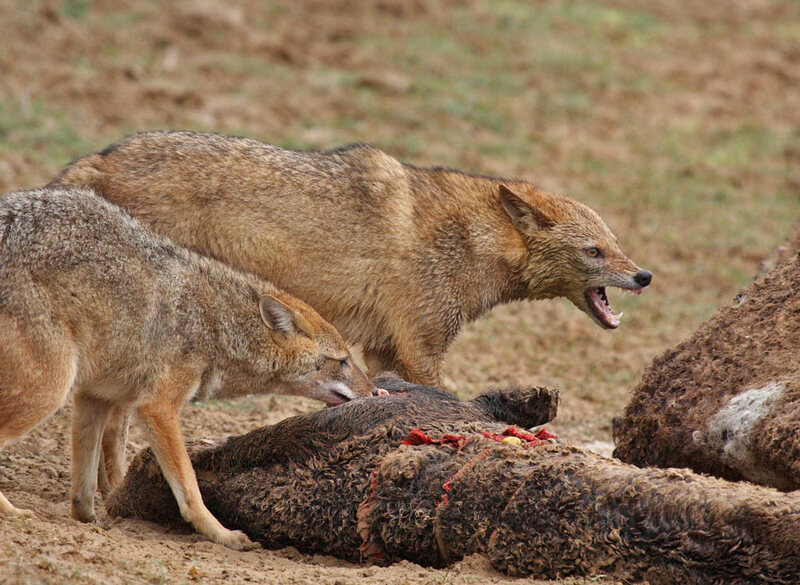 jackals play an important scavenging role by eating garbage and animal carrion around towns and villages. 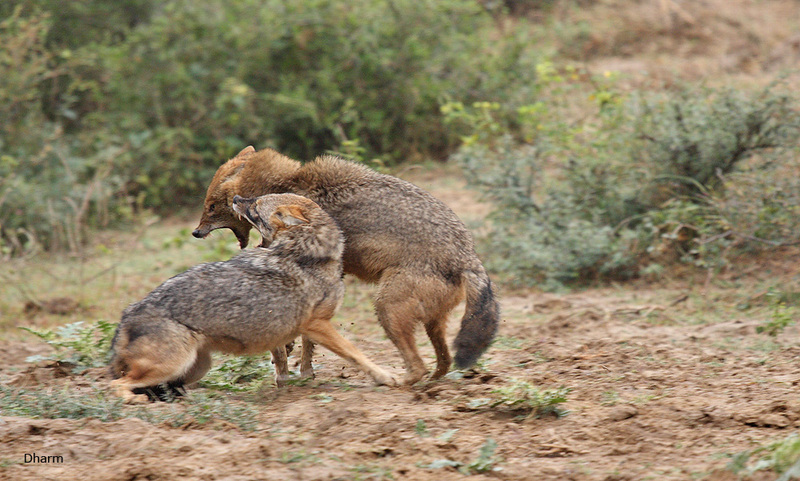 strange jackals meet each other, most of the behavior expresses subordination, superiority, or eagerness to attack. 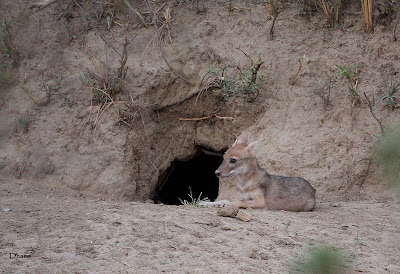 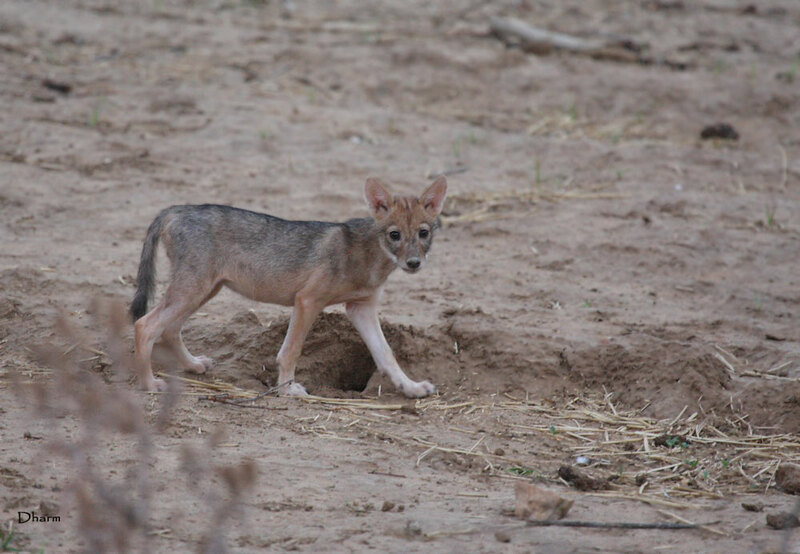 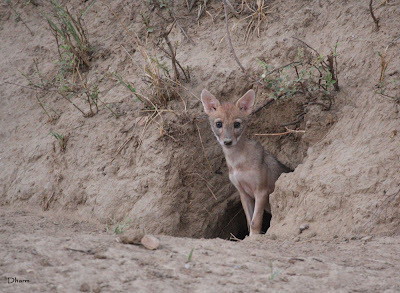 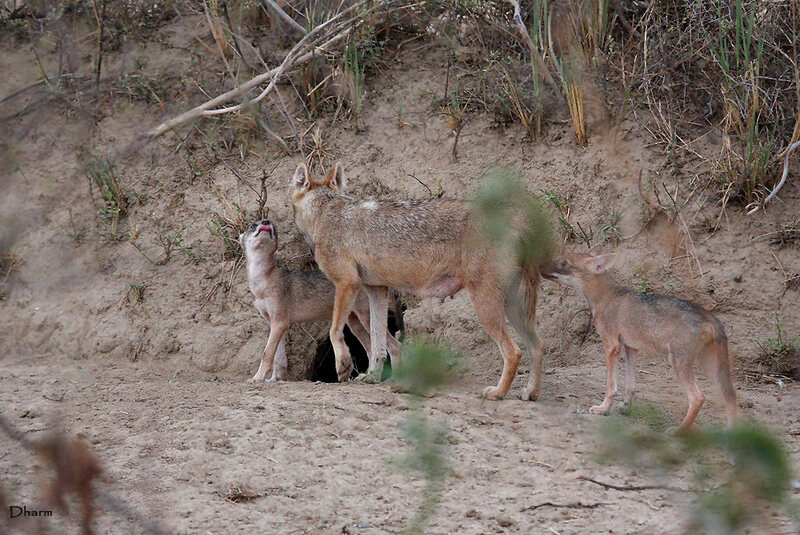 Jackal pups come out of the den only after 2 weeks of birth, thats when weaning begins and external foods are bought to den by parents. 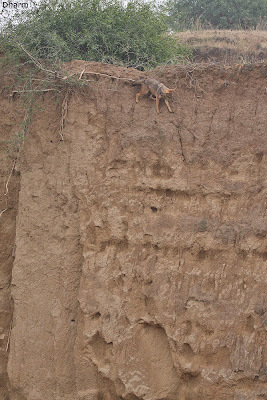 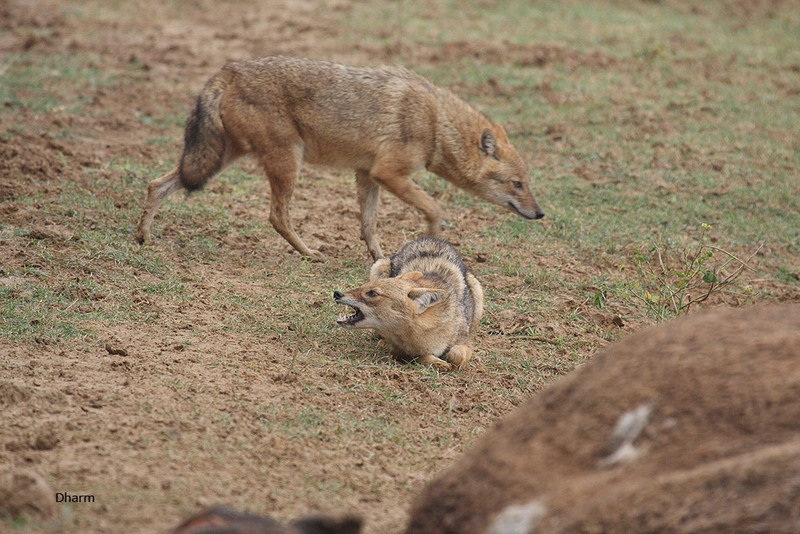 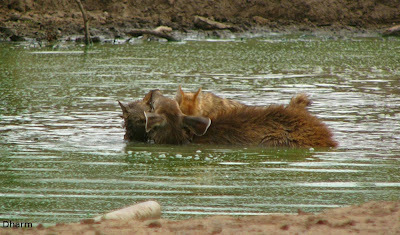 Male and female members of a golden jackal pair have important roles in maintaining their territory and in raising the young. 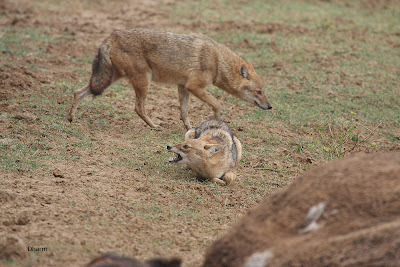 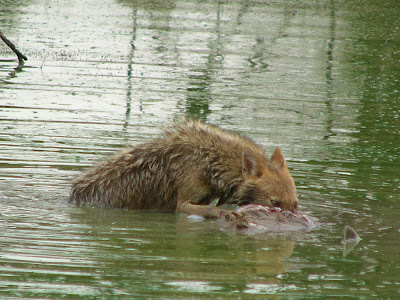 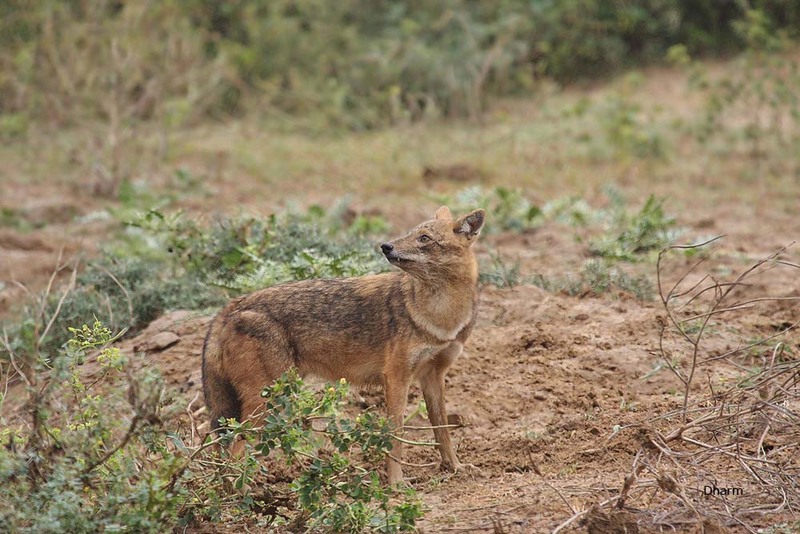 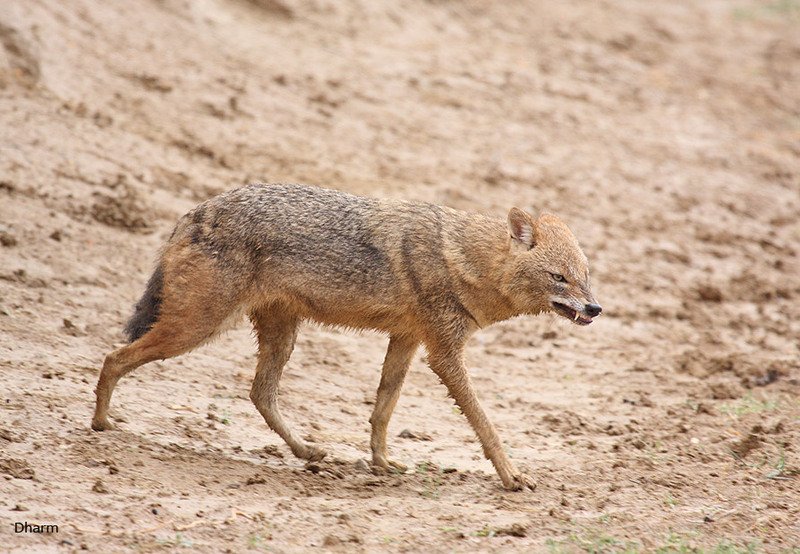 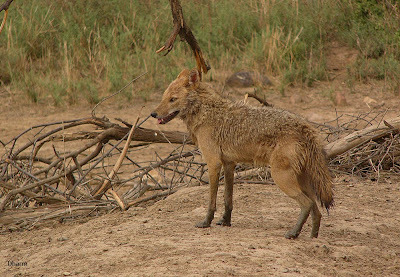 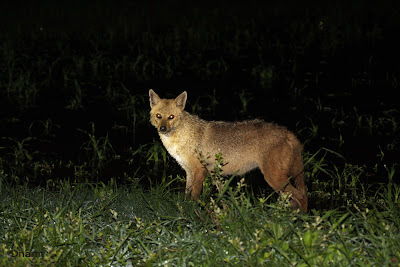 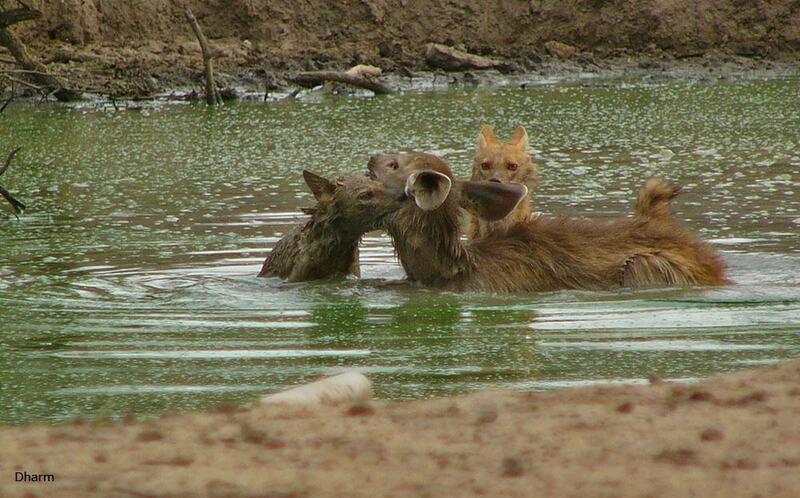 The basic social unit of the golden jackal is a mated pair or a mated pair and its young. 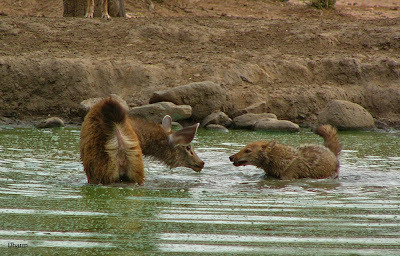 Young males breed only after age of two, older litter often stays back near parents and they may form a family unit. 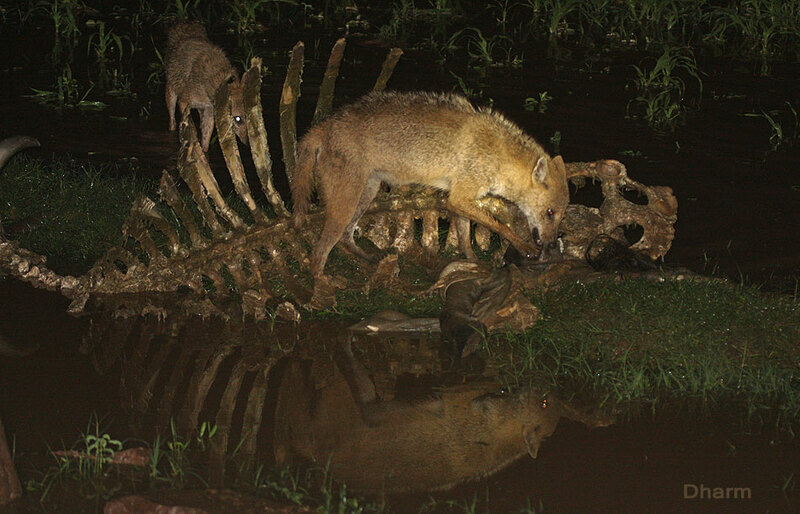 Having a feast tonight ! 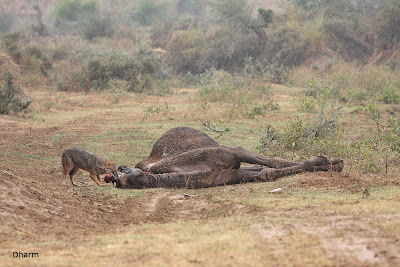 The camel got a new tail ! 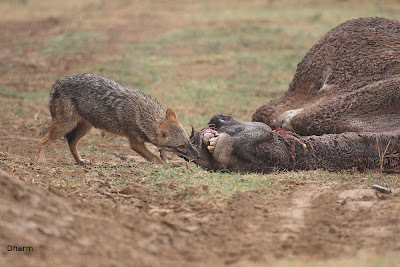 OK ... 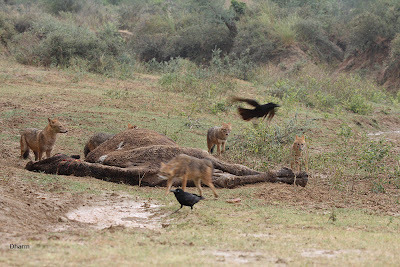 I am done, do you want a share too? 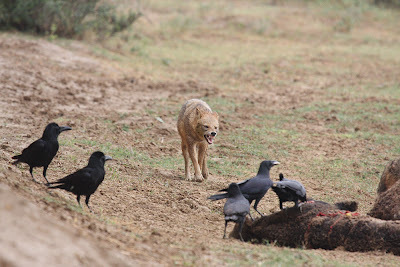 :) Amazing Photo Log ! Nice Pics Dr. Dharmendra Sir and write up Divya :) Thank you for sharing. Amazing pictures, absolutely engrossing ! 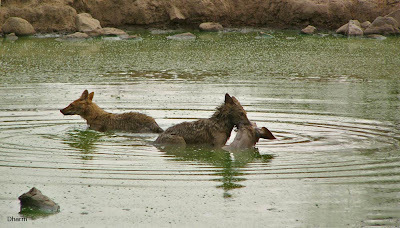 Excellent photo-documentation both from an animal behaviour perspective as well as aesthetics and very good description to go with the pictures. 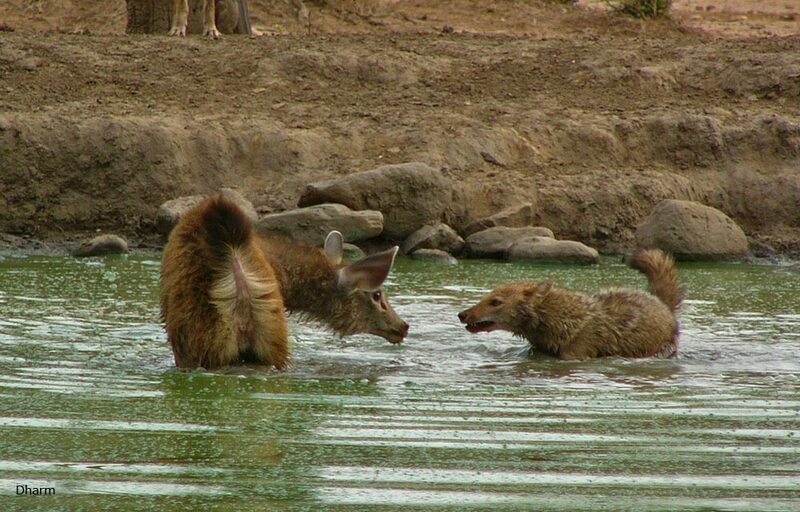 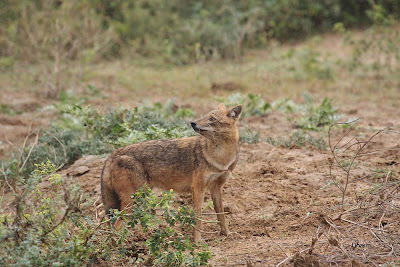 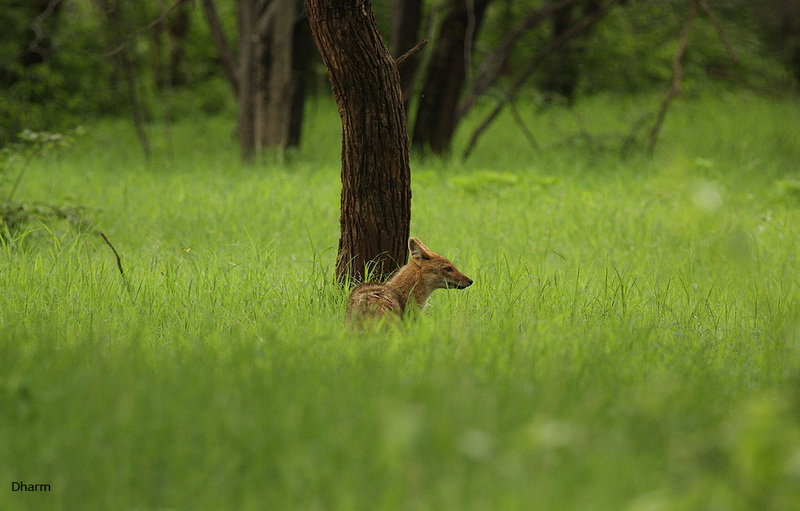 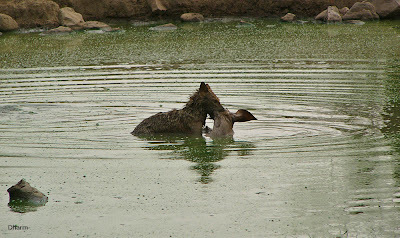 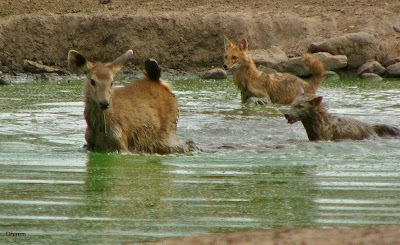 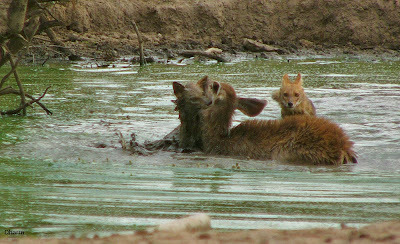 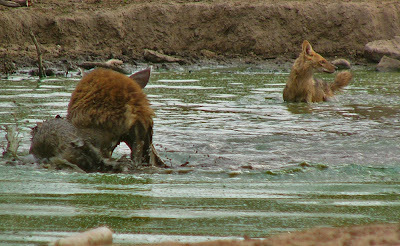 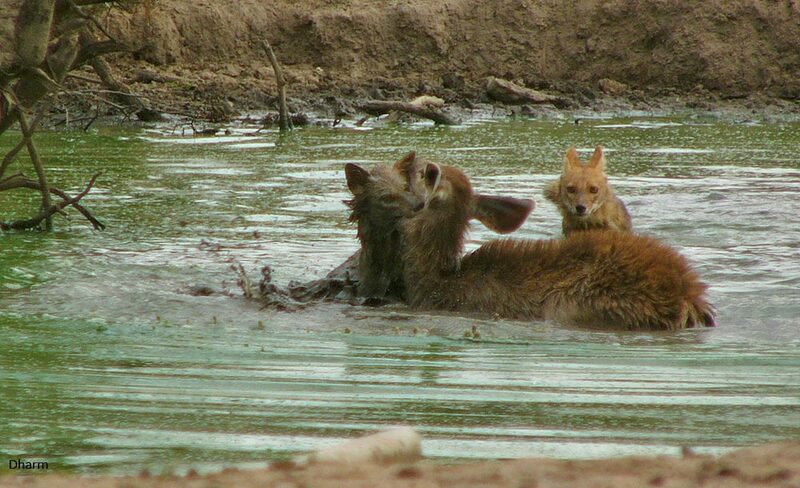 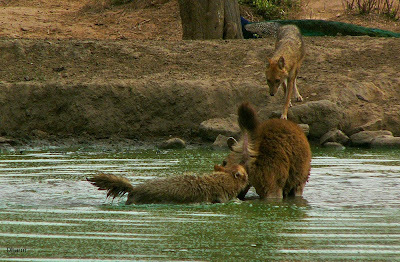 The pictures of jackals killing the sambar fawn are especially valuable as they document a little observed behaviour of the species. 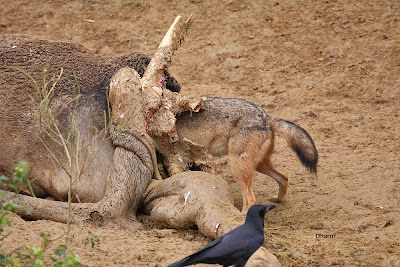 Well done and thanks for sharing. Once again, Amazing pictures! 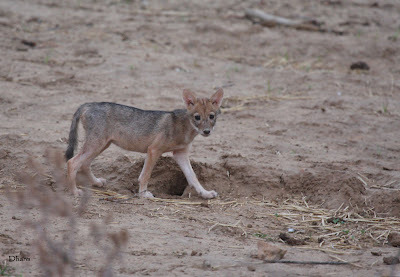 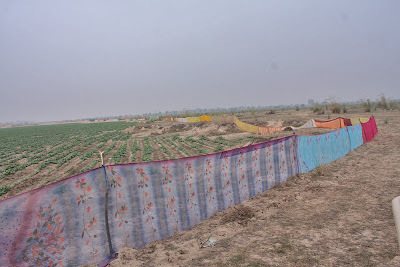 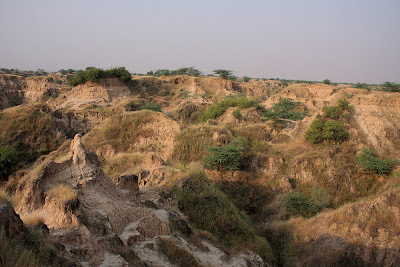 Thanks so much for sharing information about a Jackal's habitat too.